Firehead Thomas – I Love It Spicy! With Valentine’s Day around the corner, February is the month of love and the Super Bowl of course. So our official cartoonist for ILoveItSpicy, Sean Boley decided to combine the two with his latest drawing depicting Firehead Thomas’ love of his Ravens. Nice job Sean! 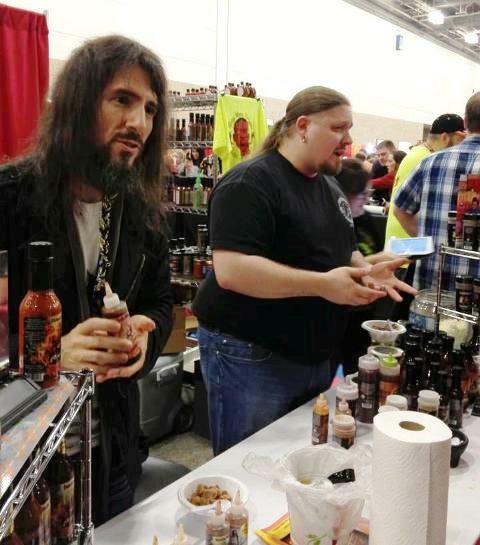 Firehead explores a little more of the show, then gets the privilege to interview the one and only Bumblefoot from Guns ‘n Roses fame along with the Godfather of hot sauce, CaJohn Hard. Bumblefoot is pictured above along with Brimstone. After that he talks with Big Papa Sauces. It’s truly awesome! Firehead Thomas takes you on a video tour of the ZestFest 2013 event in Los ColinaS, Texas. He mixes some interviews and some vendor highlights. 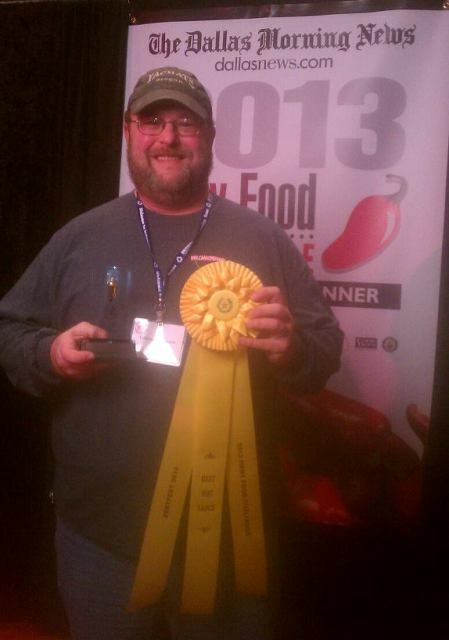 As announced on Thomas’ video yesterday, pictured above is Tim Bader of Volcanic Peppers with his Best Hot Sauce Ribbon. Quite an honor.